The lecture will take an overview of the role of everyday documents in illustrating the economic development of the United Kingdom in the nineteenth century, ranging from newspapers and manuscript letters of the period to invoices embellished with views of dark satanic mills, bills of lading for goods exported and samples of materials manufactured at the time and still perfectly preserved in form and colour. After graduating in History from the University of Stirling, John Scott emigrated from north of the Border to work for Morgan Grenfell, rising to be a Director and, after the merger with Deutsche Bank, to be a Managing Director of the latter with responsibility for Public Sector Finance. He was elected to the Bank&apos;s Ward of Broad Street in 1999 and retired from banking in 2002 on reaching 55 years of age. Since then he and his wife have formed their own Company, Historystore Limited, which trades in antique documents and publishes historically-themed merchandise. 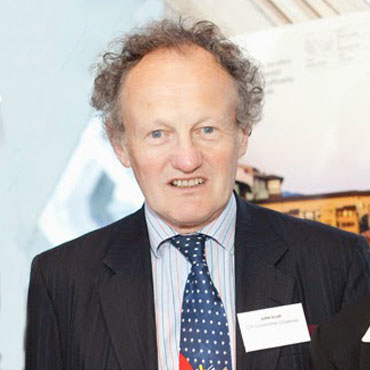 He writes regularly for magazines and is currently the Chairman of the Culture, Heritage & Libraries Committee of the City of London Corporation. Ephemera – what is it and does it matter? The first question is quite easy to answer – my favourite definition is a transient document of everyday life – once its original purpose was served its life came to an end and the evidence of its existence ceased. A classic example of twenty-first century ephemera is the bus ticket and I can just imagine that in 200 years time, historians will be debating upon the purpose served by a zero fare bus ticket (1) – its equivalent from 300 years ago would have been the toll ticket (2) and the fact that so few were kept explains why these tiny documents are now so rarely seen. On the other hand, a decorative topographical print is not strictly ephemeral since it was intended to be preserved, which can cause confusion when the same printing plate was used for two products – for example the only way of telling a sheet of Victorian writing paper from a booklet of views sold to tourists is the paper – writing paper is thin enough to be folded, souvenir views are on porcelain card. This transient life helps to explain both why ephemera has tended to be ignored in academic circles and why I hope that you will agree that those examples which do survive really can add to our understanding of their world. Ephemeral documents can be manuscript or printed or, of course, a combination of both and as soon as you have a written element each item becomes truly unique. With a few notable exceptions, such as the John Johnson Collection at the Bodleian, which was created solely on the initiative of the eponymous curator, ephemera was simply not deemed to be worthy of preservation by institutions. The majority of those which have survived did so either because they were preserved by a family or they had a legal or financial reason for their preservation. For example, both the ownership and hiring of horses was taxed and the traveller was issued with a ticket to show that the duty had been paid. At each staging post on the road the initial ticket was handed in and an Exchange Ticket was issued in its place. If the horse had been hired for more than one day, the charge for the second and subsequent days was not taxed but was evidenced by the issue of an Exemption Ticket for the first stage, which was then replaced by a Check Ticket. Since only the first ticket had a monetary value the others tended to go in the dustbin of history and so far as I am aware exist only in proof form. Ephemera has been around for as long as humans have needed to record information and Around the World in Sixty Minutes is no more practical for me today than it would have been for Jules Verne. So in the time that remains I am going to take a specific country, Great Britain, and a particular period of history, namely the Industrial Revolution, in which to try to demonstrate to you why more notice deserves to be taken of ephemera. I have chosen this aspect for a number of reasons: in the first place the inspiration for this lecture was the former Provost, Sir Roderick Floud, whose future book on the economics of garden history will, I am sure, take advantage of ephemeral sources. Secondly the ephemera of the Victorian era is not only accessible but also very visual and it is a period of this country’s history which we can still relate to. Finally we are, of course, in the heart of the City of London which has been at the centre of trade ever since Roman times so, although ephemera has a much wider scope, it is our mercantile history which forms the core of my talk. Only last week Sir Tim Berners-Lee was given the Honorary Freedom of the City in recognition of his exceptional contribution to the information revolution and to the transformative effect which the web has had upon the world. But the Industrial Revolution also transformed the world for earlier generations and it is my contention that without the relative speed and efficiency of the transfer of knowledge in Victorian England then the course of change would have been much slower. When Philip Corsini arrived in London in the mid sixteenth century the merchants of the time used to close off the end of Lombard Street with a row of chairs in order to complete the day’s business. By 1571 Sir Thomas Gresham had opened the Royal Exchange so that information could be exchanged in rather more commodious surroundings but it was not until 1635 that Charles I made the Royal Mail available for use by the general public. The Third Report of the Select Committee on Postage in 1838 makes the point that “the safe and speedy conveyance of letters, for the benefit of trade and commerce, was the primary consideration with the Government on the first establishment of a General Post Office; the revenue which it was expected would arise was held to be of minor importance”. From an early date, commodities had been priced in newspapers but these tended to be weekly publications and the availability of the same information to any reader offered little competitive advantage to individual traders. Hence the development of printed lists or Prices Current prepared by wholesalers and addressed to individual customers. While such communications did not arrive in the instantaneous nature of an e-mail, with up to ten mail deliveries in London each day and a preferential delivery service for merchants in the City, a customer could receive information and act upon it within a single morning. The cost of sending an ordinary letter at this time was prohibitive for the bulk of the population but, in accordance with the Government’s initial intentions, commercial information such as Prices Current could be sent free of postage by the Clerks of the Road in return for a modest perquisite from the subscriber. Here we see William Ogilvy (3), Clerk of the North Road, offering Mercantile Intelligence to his subscribers in 1800, including Lloyd’s List. But these were still general market lists and it was not until 1837 that the Treasury authorised the posting of prices current for the heavily subsidised price of one penny whether being sent inland or to the British Empire. This set the scene for Rowland Hill’s reforms of 1840 which established a uniform penny post rate and eliminated a system that charged both by weight, distance and the number of sheets of paper. Apart from the huge numbers of letters sent free of charge by Members of both Houses of Parliament, the illogicality of the system meant that it was significantly cheaper to send a letter from London to the wilds of Suffolk than it was to a manufacturing centre such as Glasgow. The Court of Common Council led the way in campaigning for cheaper postage through the Mercantile Committee and some 5,000 petitions were sent to Parliament in the three years leading to reform. Those of you who want to learn more about this fascinating part of the story are encouraged to visit the exhibition at Guildhall Library next May which draws upon the knowledge and expertise of the present Father of the House, Deputy Anthony Eskenzi. Establishment figures such as the Postmaster General, Lord Lichfield, and the Duke of Wellington were wholly opposed to any reforms but by this time it is estimated that five-sixths of letters from Manchester to London were carried privately in breach of the Post Office’s monopoly. One Manchester business house told the Committee that “we should consider the general reduction to a penny as one of the greatest boons that could possibly be conferred on the trading interest – a measure of almost equal importance but of greater safety than even the repeal of the corn laws”. When postage rates were reduced as a temporary measure to 4d on 5th December 1839 there was a striking 120% increase in internal correspondence within the country which Disraeli observed constituted a “revolution overnight in thoughts and attitudes”. On January 10th 1840, postage was dramatically reduced still further to one penny and the volume of chargeable letters rose from 75 million in 1839 to 207 million by 1842 and 327 million by 1846. While the financial impact upon the postal revenues was debateable, the benefit to commercial enterprise was undeniable – a wholesale grocer reported to the 1843 Committee of Enquiry that his correspondence had quadrupled, his credits had shortened, his payments were quicker and his orders more numerous as a result of the reforms while Pickford & Co., the carriers, testified that they had sent eight times the number of letters in 1842 that they had in 1839. By 1850 no fewer than 500 Prices Current were registered with the General Post Office to ensure that they could be sent across the Atlantic for one penny, as opposed to one shilling for an ordinary letter. As Sir Tim said last week, the reforms to the postal system created connectivity in a comparable way to the worldwide web and I would suggest that this revolution is reflected in contemporary ephemera. Prior to 1840 much of the finely engraved commercial correspondence emanated from retailers supplying the high-end domestic market. Since documents such as invoices would normally be sent with the goods, there was no added cost of postage and consequently it was of less importance that a significant part of the paper was taken up with printed images or text. After 1840, with a burgeoning middle class and a much cheaper means of communicating with them, marketing became the priority. While we may think of smoking chimneys as a pollutant, particularly in a Chinese context at present, 150 years ago we were in much the same position – smoke was a symbol of activity and therefore of prosperity. There is certainly an abundance of smoke issuing from every orifice of Moorfield&apos;s Tile & Pipe Manufactory (4) near Kilmarnock in 1850 - the letter incidentally is seeking a railway siding to serve a new factory from the Glasgow & South-Western Railway. Artistic licence undoubtedly played a part, elevating aspects such as railway engines so that they appear more dominant than their surroundings or even inserting canals where none existed in the vicinity. However the images of factories, workers and products are often the only visual image that remains and the jobbing artists seem likely to have made a reasonable likeness of the day to day people and objects with which they were familiar. Murdoch, Aitken & Co’s letter of 1853 (5) is handsomely decorated with symbols of their enterprise as befits a supplier of Railway Wagon Weighing Machines to Glasgow Station. Similarly there is little reason to doubt the accuracy of the Hawthorn engine (6) on their notification in 1850 that two railway engines had been supplied to the Glasgow & South Western Railway. Pride in the product was an attribute of many a Victorian industrialist, as expressed visually in the images of medals won at the industrial exhibitions which proliferated in the second half of the nineteenth century. Joseph Cowen’s fire bricks made in Newcastle won such an award at the Great Exhibition of 1851 (7) which no doubt contributed to winning orders in North America where a scion of the family, John Cowen, visited the Providence Gas Works in 1860. As the years progressed many industrial buildings were adapted for other uses – Alton Mill (8) began life in 1734 making brass and copper wire but by 1775 had become a paper mill as did the Eagle & Alder Mills in Tamworth (9) which took advantage of the growing volume of textile waste arising from the mechanisation of that industry. I suspect that the mill did not look quite as impressive in reality since Charles Fisher employed only 24 men. In the 1790s John Hives and Moses Atkinson rebuilt the woollen and cotton mill at Bank Mills in Leeds for manufacturing linen yarns, evidenced by their extensive price list of 1841 (10) offering five different qualities to a firm of table linen manufacturers in Dunfermline. By 1833 Bank Mills had become a very sizeable enterprise of six storeys in a twenty bay block and this expansion from cottage industry to factory is borne out by two invoices from the Britannia Foundry in Bedford in 1838 (11) and 1870 (12). The interiors of such enterprises seldom feature, perhaps they were too redolent of dark satanic mills, and Samuel Walker (13) was quite unusual in showing the processes involved in the manufacture of wire and tubing, namely the wire mill, the rolling mill, the tube mill and the annealing muffle. By this time in 1853, lithography had tended to replace engraving and, although the loss of quality in terms of the image is regrettable, the economic logic is understandable, which means that we have to look to the Continent to appreciate the true beauty of Victorian engineering. This form of iridescent printing (14), in which Belgium specialised, relied upon the use of mercury powder so the method died along with the workers but that as they say is a story for another day. Ephemera allows you to see the processes involved, here pigments being ground for paint in Macclesfield in 1823 (15), what well-dressed people were wearing in 1819 and what the well-dressed shop window looked like in Maryport (16). You can even see exactly the same materials as they did since samples were often sent by post to prospective buyers and, being enclosed within a letter, they have survived as pristine as the day they were made. Accurate and timely knowledge of commodity prices was of huge importance to a successful trader and we are fortunate that such information tended to be filed rather than being destroyed and so, even when made redundant by the next edition, the ephemeral evidence survived, or at least it did so until the impact of future wars and of commercial reorganisations. So what can we learn today from such apparently mundane documents? As is evident from the fact that you cannot read the detail of Sanford’s Merchants’ and Planters’ Price-Current of 1851 (17) the single sheet of folded paper is packed with about as much information as it was possible to cram in. Being printed in Mobile, Alabama, it is scarcely surprising that cotton features highly and the predominance of Great Britain, and indeed of Liverpool, is evidenced by the export figures showing that over half of all cotton exported from Mobile was shipped to Great Britain with Liverpool accounting for over 85% of United Kingdom imports. The list provides similar statistics for nine of the principal cotton exporting ports in the United States in addition to a market review since the last edition a week earlier. Ruling the waves was another important factor in the transmission of information although by 1851, Great Britain had been forced to share our dominance of the Atlantic shipping lanes with the Americans and this Prices Current shows the depressed state of the market when news of the latest Liverpool prices arrived in New York on the mail steamer “Arctic” and was telegraphed to Mobile. Even French merchants in both North and South America were forced to rely upon British mail routes for their correspondence which gave a competitive advantage of several days to the United Kingdom. But type-setting itself was time consuming and resulted in delays which could be crucial in time to catch the mail with the latest prices and the Victorians were extraordinarily innovative in making devices to enable facsimile printing, often in the language of the country to which the price list was being sent. A typical example is Busch & Company’s Cotton Circular of 1851 (18), written by a clerk in German for transmission to that market and then reproduced in facsimile form by a Liverpool printer – the only drawback for the recipient was trying to decipher the handwriting on poor quality lightweight paper necessitated by continental postal rates generally rising above each quarter ounce compared to half an ounce in Great Britain. Another commodity upon which the Industrial Revolution depended was coal and while the coal mines are themselves but a distant memory, their evidence lingers on in the shape of ephemeral survivors. The London Coal Exchange set prices three times a week and in 1801 (19) lists no fewer than 64 collieries in Newcastle and Sunderland while Bills of Lading illustrate the importance of the coastal shipping trade as with Captain Gibson’s good ship “Providence” carrying coal between Sunderland and London in 1778. In 1700 more than 40% of the coal mined in Great Britain was extracted from the north-east at a time when British pits were producing about 3 million tons per annum, rising to 30 million tons by 1830, 75 million tons by 1855 and 100 million tons in 1865. The availability of such a relatively inexpensive energy source on such a scale underpinned the Industrial Revolution and the interdependence of coal, iron, ship-building and chemicals is demonstrated by the map on Palmer Hall&apos;s striking Price Current of 1896 (20) which also lists the freight charges per ton to over 200 overseas ports. Incidentally the subsidy on commercial correspondence is evident from the ½d stamp compared to 2½d for a letter to Norway at this time. By contrast, the Welsh valleys were responsible for only 3% of national output in 1750, a proportion which had increased to 20% by 1913, largely on the back of steam coal and much improved infrastructure. In 1847 about 30% of Welsh coal was exported and Matthew Wayne was the first to ship steam coal from Aberdare Basin to Bute Docks by canal and from 1841 by the Taff Vale Railway. The use of the French language and the inclusion of a map of his coal mines (21) with their connections to transport facilities was intended to communicate the pre-eminence of the company to the customer. The circular pattern of trade is an aspect of business with which we are all familiar but which can again be illustrated by ephemera, as on the letter to Copenhagen in 1847 informing the recipient that 110 tons of furnace coal had been shipped to the Baltic from the tiny East Lothian port of Cockenzie (22), now more remarkable for the site of a coal-fired power station, ironically closed in 2013, with railway sleepers forming the return cargo. Perhaps a less obvious form of barter is the 5 tons of cheese ordered by Bayley & Shaw (23), a firm of leather dressers in Nottingham, in exchange for their cargo of skins shipped to New York in 1846, the previous cheese shipment having been thrown overboard owing to rough seas. The importance of coastal shipping, particularly before the railway network developed, was vital for the transportation of heavier goods such as coal and paper. Paper mills consequently tended to be fairly dispersed across the country but the demand in London far exceeded local capacity and the well-developed paper industry outside Edinburgh regularly shipped product to London, as shown on this shipper&apos;s schedule of 1853 (24). Canals and then railways transformed communications in the Industrial Revolution but they also caused huge disruption. Henry Trotter lived at Morton Hall near Edinburgh in the 1840s and the green line on his letter (25) shows the course of the North British Railway straight through his garden, evidently he was not enough of a landowner either to divert the railway or to have his own station. He writes that “on Friday when we were settled at dinner three men were discovered at the point where the poplar tree stands alone in its glory and we were not long in making out that they were Railway surveyors by the implements they carried. You may imagine we watched them narrowly from the windows & I have drawn a blue line on the sketch to show where they went, right through the fresh water pump, straight through the young wood and then through the centre of the gooseberry bushes – the men told him that was the best line if the railway went on”. The social upheavals of the time can be relived vividly in eye-witness accounts on ephemeral documents such as the letter written from the Tredegar Iron Works in 1841 (26). The writer, Mr Blair, was evidently a trainee lawyer who had found work with a Catholic Whig attorney with a large common law practice in south Wales, who served also as Town Clerk and Recorder of Newport. He reports that “Chartism is smothered but not extinguished – at a meeting called by the Mayor of Newport to address the Queen, all business was interrupted, 3 groans given for the Mayor & 3 cheers for Frost, Williams & Jones – F. O’Connor is coming here they tell me”. John Frost, Zephaniah Williams and William Jones have the dubious distinction of being the last people in Britain to be sentenced to be hung, drawn and quartered for their role in leading the Newport Rising in November 1839, a sentence which was later commuted to transportation for life by Lord Melbourne following a campaign led by Feargus O’Connor. The evidence of the repatriation of wealth is a frequent theme in ephemeral sources – James Mackie (27) was a leading plantation and slave owner in Charleston, South Carolina, and in 1812 he sent back a Bill of Exchange for £565.00 to his bankers in Edinburgh. That does not sound like a lot of money today but its current equivalent value ranges between £32,000 if you simply look at the percentage increase in RPI to £1,855,000 if you factor in the economic power of that amount of wealth. Such documents survive because, owing to the hazards of piracy and of shipwrecks, it was customary to send three copies of such potentially valuable documents. In this instance the first copy was sent by the ship “Lady Gallatine”, the second by the “Savannah” and the third by the “Doris”. Since all three arrived safely, this third copy was simply filed at the Bank within its original letter where it remained until I opened it two hundred years later. The popularity of shares in infrastructure and raw material businesses knew few bounds and lengthy lists of prices proliferated printed on huge sheets of paper. While many of the more exotic ventures disappeared without trace, others such as the Mount Bischoff Tin Mining Company in Launceston (28) prospered sufficiently for dividends to be remitted back to the original shareholders. But not all the wealth created by the Industrial Revolution was spent in such a constructive fashion. John Arkwright, the grandson of Richard, used his fortune to buy Hampton Court in Herefordshire, which he remodelled in the 1830s, buying Brussels carpeting from the Original Carpet Warehouse in London Wall (29). A headline in the Financial Times on 5th September 1912 bemoaned the fact that bankers were crowding out the brewing and distilling interests whereas brewing and banking were bracketed formerly as the two pre-eminent industries of the country. With banking halls now increasingly turned over to wine bars and restaurants, where most of the clientele at any one moment will be communicating with the world on electronic devices, the wheel has turned full circle but I wonder what ephemeral evidence of such a change will survive into the next century. With only fifty minutes at my disposal I have been able to do no more than to scratch the surface of such a vast subject but I hope that I have convinced you of the value of ephemera to the researcher trying to delve below the surface of published sources and mine the rich vein of untapped wealth that lies beneath. Wonderful though Powerpoint is it does not do justice to some of the more sizeable ephemera of the time, and even less so to the samples of Victorian fabrics so for those of you with a few moments to spare after questions do take a look at the Real McCoy in the frames.